What is the best thing on a rainy day? A sweet treat of course! But not just any sweet treat. Today we had the pleasure of sampling cake pops to include in our wedding dessert display. I have to say that the best part of wedding planning has to be food and dessert tastings! Now, I am not particularly fond of formal wedding cakes so when it came to deciding on a dessert menu, I knew immediately that was not a route I wanted to take. After more googling on potential ideas, I came across Bakerella’s site on Cake Pops. 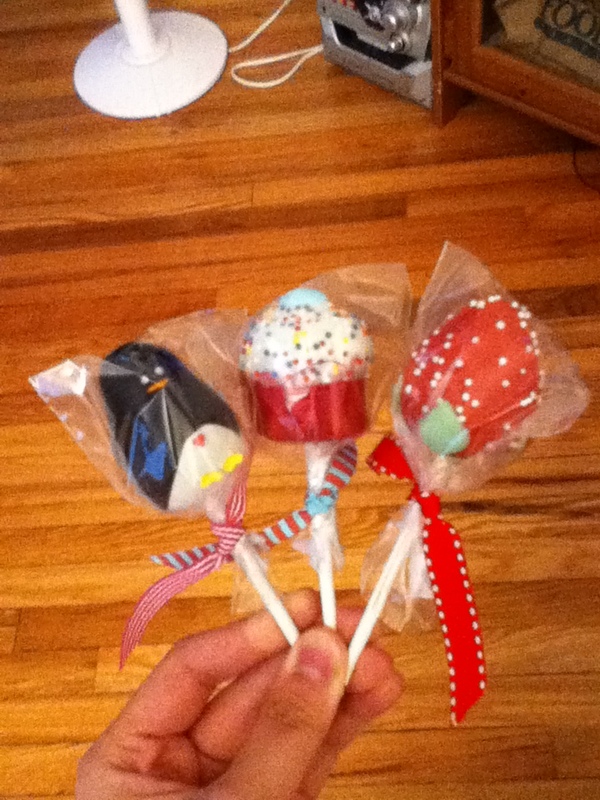 Cake pops are cake bites molded, decorated, then put on a stick for eating ease. There are a ton of recipes online to make these. You can order these in all cake flavors in they are covered in chocolate designed to match your theme. I am particularly interested in the little penguins, absolutely adorable! How fun would it be to have a little penguin groom and bride. Each one is big enough for 3-4 bites, the perfect sampling amount! Right now I am still trying to figure out possible designs for the wedding but I am excited with all the possibilities. I think these would be fun ideas for all occasions including birthdays, holiday celebrations, and even family gatherings. So if you are planning a party or just looking for a bite size dessert, keep these in mind! We are planning on building a display (stay tuned for a future post) for all of the pops and other desserts!